Diabetic Retinopathy is the leading cause of vision loss among working-age Americans. 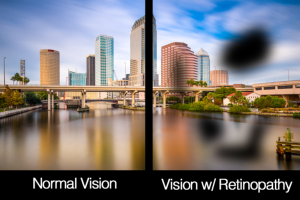 Loss of vision occurs primarily due to damaged blood vessels in the Retina. Diabetics have 25 times the usual risk of blindness, most of which is preventable with early detection and treatment. It is recommended that all diabetics have an annual dilated eye exam to screen for any retinal changes. These late complications can result in severe visual impairment, therefore early treatment is critical. A Newsom Eye Retina Specialist can check your Retina for signs of diabetic damage. In early Retinopathy, small aneurysms, bleeding, or lipid deposits are seen. In advanced cases, swelling can occur in the center of the Retina, termed Macular Edema. Neovascularization, or growth of abnormal blood vessels, occur in severe cases and may lead to bleeding within the eye or retinal detachment. The main treatment for Diabetic Retinopathy is laser. Focal laser treatment can be applied to damaged blood vessels to control Macular Edema. For Neovascularization, more extensive (pan-retinal) laser treatment may be needed. Injections of steroid or other medications can also help in patients who do not respond to laser treatment, however, in severe cases, surgical intervention may be necessary.